Sometime last year I purchased fabrics to make a small quilt. The pattern, well there really wasn’t a pattern, was simply to add two borders around the perimeter of a remnant piece of fabric. I really didn’t want to spend a lot of time cutting and piecing together an elaborate design. My main focus was to use the specimen as a practice piece for my long arm quilting. Sadly the fabrics sat idle for a very long time. So many other projects seemed to take precedence. Earlier this month I made up my mind it was time to bring that small project to the forefront. Last week I removed the blue and tan quilt from my quilts-in-progress storage area and installed it on my long arm quilter. I had a blast marking and stitching patterns that I believe compliment the fabrics quite nicely. Start to finish the entire quilting process took relatively little time. After squaring up and removing the excess fabric I once again set it aside. However, the time spent idle, on this leg of the journey, would be brief. You see I had a much more pressing engagement to attend. I spent the weekend with my grandchildren at a water park in the Wisconsin Dells. Now that I have returned from my adventure I am ready to finish the project. By this time next week I will have the binding attached and the quilt completed. 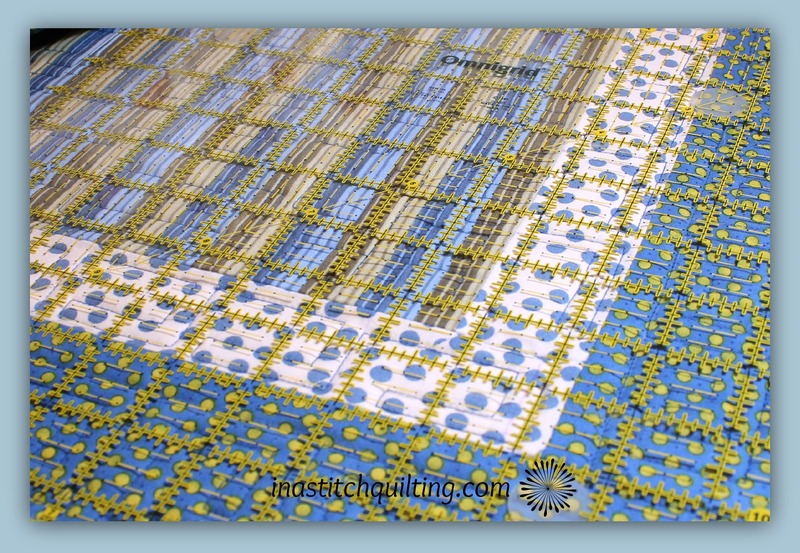 If you are wondering what the small, blue and tan quilt looks like I have one sneak peek to share. That’s all you can see for now. If you want to see the finished project you will just have to return next week for the final viewing. Until then have a super day! Now go and get busy on your own unfinished projects.